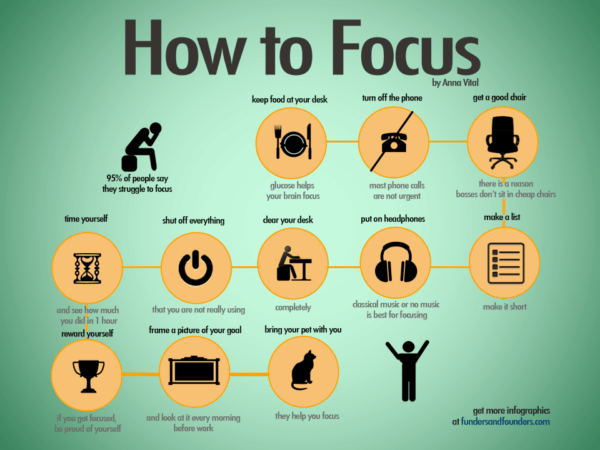 Tips to help you concentrate – A good visual with some interesting tips to help you focus. I definitely can not concentrate with music playing. Below is a round-up of the 11 tips to help you stay focused. 1. Keep food on your desk. Glucose help your brain focus. 2. Turn off the phone. Most phone calls are not urgent. 3. Get a good chair. 4. Time yourself and see how much you did in 1 hour. 5. Shut off everything that you are not really using. 6. Clear your desk completely. 7. Put on headphones. Classical music or no music is best for focusing, your brain does one thing at time – listen to music of study ! 8. Make a list. Make it short. 9. Reward yourself. If you get focused, be proud of yourself.